On 1 January 2017, Metro will introduce a number of changes to its fares, including an annual fare increase. Fares will increase by between 10 and 20 cents for urban passengers and 10 and 90 cents for non-urban users. At the same time, in line with the recently gazetted Metro Fares Order 2016, Metro will introduce a new zone based urban adult fare structure, replacing the existing complex section based system. Hobart will have five urban fare zones, Launceston will have two urban fare zones and Burnie will entail a single urban zone. 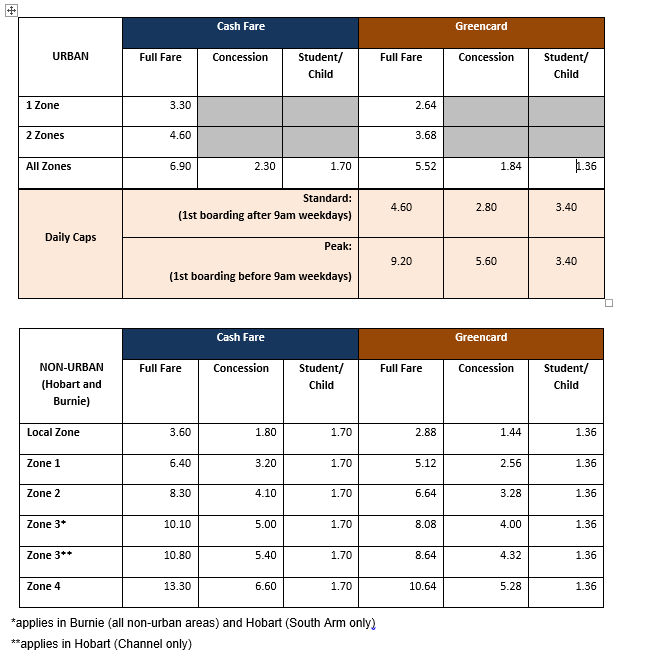 Urban adult fares are currently based on the number of sections a journey involves: Short (1-4 sections), Medium (5-10) or Long (11-15 sections). The new zone based system means urban adult passengers will purchase tickets based on how many zones they travel within: 1 Zone, 2 Zones, or All Zones. 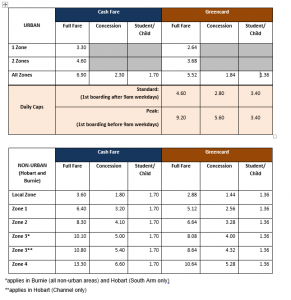 Student and concession passengers will continue to pay a flat rate regardless of the number of zones travelled. Metro Chief Executive Officer Stuart Wiggins said: “The change to urban zones is designed to make catching a bus easier to understand, and ensure we have a fare structure that is more relevant for contemporary Tasmanian public transport networks. “When purchasing a ticket it will be clear how many zones a passenger is going to pass through and the use of easy to understand visual maps will make purchasing the correct ticket a simpler exercise. “Metro is committed to providing a transport system that is equitable and meets the needs of the majority of the travelling public and this reform is a key part of meeting these aims now and into the future. Mr Wiggins said with the successful implementation and growth of Greencard, the time was right for Metro to address the inherent complexities of its legacy systems. “Using Greencard still provides a 20 per cent discount on fares, free transfers in the urban area, and low caps on the cost of daily travel. Those still not yet using a Greencard are encouraged to start enjoying the most cost effective travel available. Maps of the new urban adult fare zones are attached. For more information visit www.metrotas.com.au, email correspondence@metrotas.com.au or call 13 22 01.